Hi. I am new here. I am best friends with cannon. We love going hunting together, which is another meaning of finding for animals. 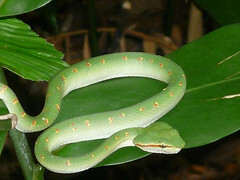 I would like to share with you the Wagler's Pit Viper I took last year in Bukit Timah Nature Reserve. Enjoy. Why don't you upload the image on Flickr, then copy and paste it? are you really from Slovenia? Forgot to change the country. Sorry about the small pic. 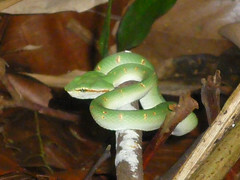 Here are more shots of the Wagler's Pit Viper. Last edited by deathmatch; 17th Apr 2009 at 22:32. Wow, you and cannon seems to find a lot of snakes. Maybe Richard and myself can join you guys on one of your outing to find snakes someday. Can we please?? You need to be very observant and silent when searching for snakes.